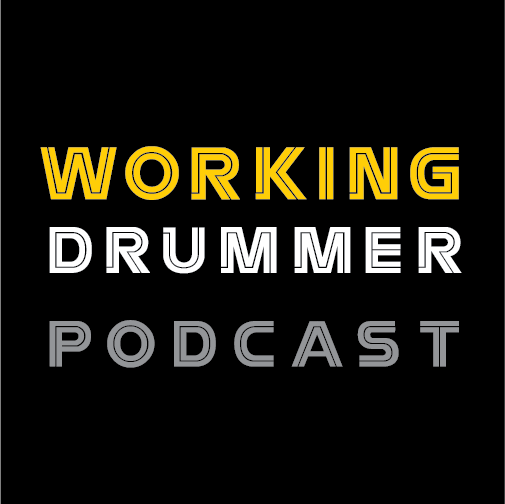 There are many unsung heroes in our drum history that have unfortunately received little attention. One so unequivocally deserving of recognition is the drummer/musician, Tommy Thomas. Until I bumped into a couple of Tommy’s drums exhibited at Steve Grier’s Discount Music Center in Orlando, Florida, I had admittedly no knowledge of Tommy Thomas. 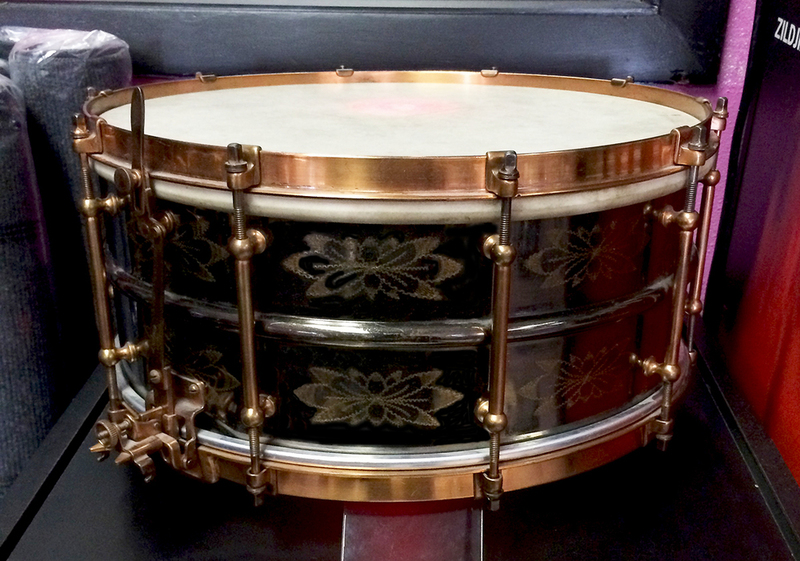 I spoke to Steve Grier about the drums, as they appeared to be an engraved Black Beauty and a Super-Sensitive in great condition. Steve mentioned that Tommy Thomas gave them to him. I said, “Who was Tommy Thomas?” He seemed surprised that I had never heard of Tommy. We talked for while and I began to realize how amazing Tommy was. 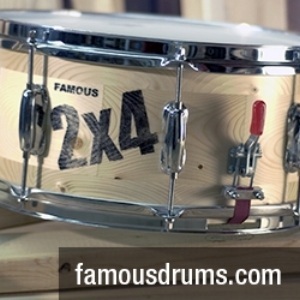 The story was much more than just two vintage drums; it was about preserving the knowledge of a drummer who gave so much and was loved by so many. Steve then referred me to Michael Welch (custodian of tommythomaspercussionlibrary.com) and Bret and Edna Nichols, who truly knew much more about Tommy and helped fill in the historical gaps. So this story began with visions of a late 1920s – early 1930s Ludwig engraved Black Beauty Super-Ludwig and Ludwig Super-Sensitive, but developed into a detailed inquiry about the incredible man behind those drums, Tommy Thomas. Damon P. Tommy Thomas, known as ‘Tommy” to all his friends, was born in 1901 in Braceville, Illinois, a small town just south of Joliet. His brother happened to be a drummer. At age 3, it seemed that Tommy was also destined to be a drummer. According to Tommy (excerpts from a filmed interview circa 1990), he would beat on his brother’s drums while he was away. His brother caught on and hid the drumsticks from him. That didn’t stop Tommy. He just got some wooden spoons and starting playing with those, until eventually the head broke. Tommy said, “He hid the sticks from me, but after I punctured a hole in the head of his snare, he gave me back the sticks!” After this incident, his family purchased Tommy his own drum, where he took it around to various churches and town meetings. At around age 5 or 6, he was asked to join in a town parade, where he proudly marched and played his heart out. Tommy’s drumming career had officially begun. 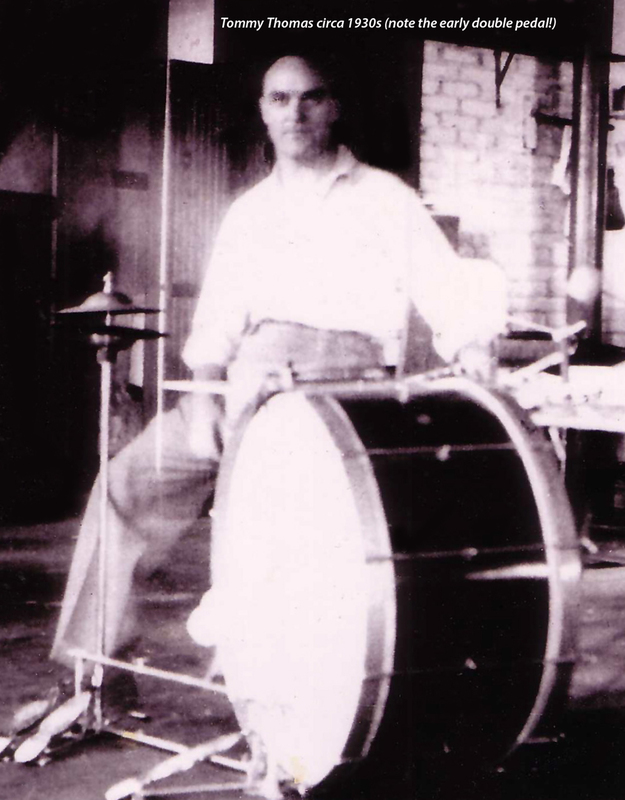 Tommy waited until he was 20 years old to receive his first formal drum lesson – from Bert Winans of Peoria, Illinois, who also later gave lessons to Louis Bellson. His skills improved on both drums and xylophone. Word soon got around about his talent. Tommy’s big break came when Earl Hoffman and his Dixieland Jazz Band came to Thayer, Illinois to play at a dance. Tommy’s friends told Hoffman about this great drummer, so Hoffman invited him to an audition. So Tommy set up his xylophone and played “Home Again Blues.” Tommy remembered the audition fondly, saying “The guys in the band flipped! Hoffman hired me for his second band, but it wasn’t long before I was playing in his regular band!” Tommy remembered Bix Beiderbecke and Frankie Trumbauer sitting in with the band on the tour. Tommy’s music career continued to take off. 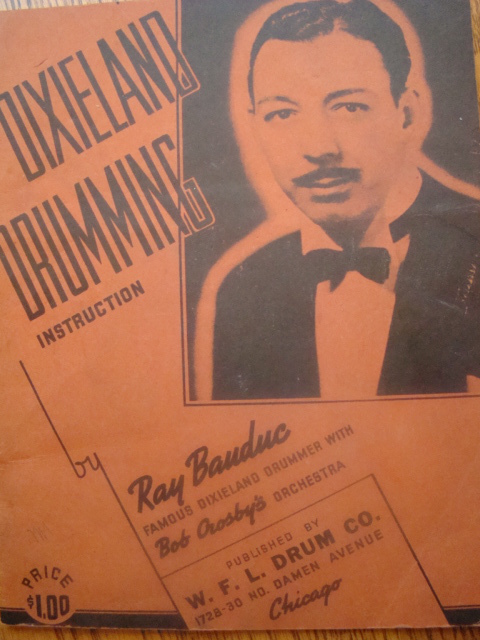 He soon landed the drum chair in the house band at Chicago’s renowned Capitol Theater. From there, Tommy played in various nightclubs and other theaters in Chicago, where jazz was really hopping. Tommy also taught himself how to tap dance, much like other Vaudeville drummers had done. According to Tommy, most of the early drummers were tap dancers. He even had a short stint on Broadway as a tap dancer and drummer in shows starring Eddie Cantor, George “Georgie” Jessel, and the comedy duo of George Burns and Gracie Allen. Don McNeill’s Breakfast Club was a Chicago-based morning comedic variety show that ran on the NBC Blue Network (later ABC) radio. 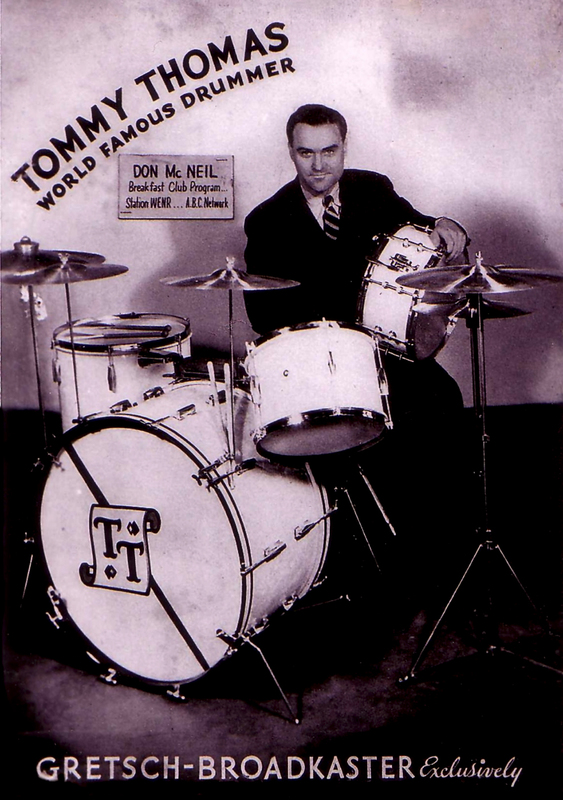 Little did Tommy know, but he would be asked to take the drum chair for this popular show in 1944; a gig that would last over 20 years and span into the early days of television. The number of famous guests on the show were countless over the years but included the likes of Jimmy Stewart, Lucille Ball and Jerry Lewis. Several videos of these shows can fortunately be found on YouTube and the WWW archives of the Don McNeill Breakfast Show. They are indeed well worth watching. In one video circa 1948, you can see Tommy tapping quietly on his thigh while Don is talking. Always thinking drums! “Well, I’m 66 years old now. So around 1970 when I was 16, I quit school to become a professional musician. Way back then, you could really make a living at it. I played for about 10 years and then decided to go back to school to get a degree in music and all that. During that time, I met Tommy Thomas. I heard about Tommy in Orlando from this friend of mine who still lives here, drummer Bobby Caldwell. Anyway, I heard that Bobby was taking lessons with this guy, Tommy Thomas. Bobby was, and probably still is, one of the finest drummers around. So I got Tommy’s phone number, and I arranged for a lesson. 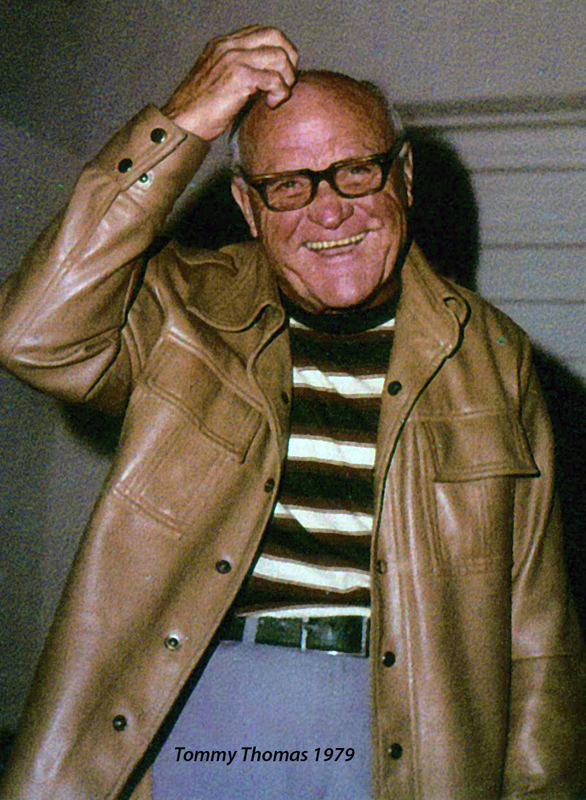 At the time, Tommy was in his 70’s (he was born in 1901). The first time I met him, Tommy would gave me a big packet of drum lesson material that he had personally written - a lot of stuff! My first impression of meeting him was in his carport. So in his garage, he had this printing machine (mimeograph? 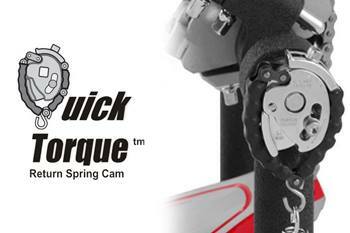 ), which made carbon copies. He was printing all his materials by hand for his students and making copies this way. There were so many others he named. I wish now I knew then how important these people were. So that was my introduction to Tommy. We remained friends for many years. He was sort of a teacher and a mentor until he moved out of Orlando around 1984. But we kept in touch even when he was in Tennessee, where he passed away in 1995. We kept in contact through the mail. I talked to him on the phone a few times. 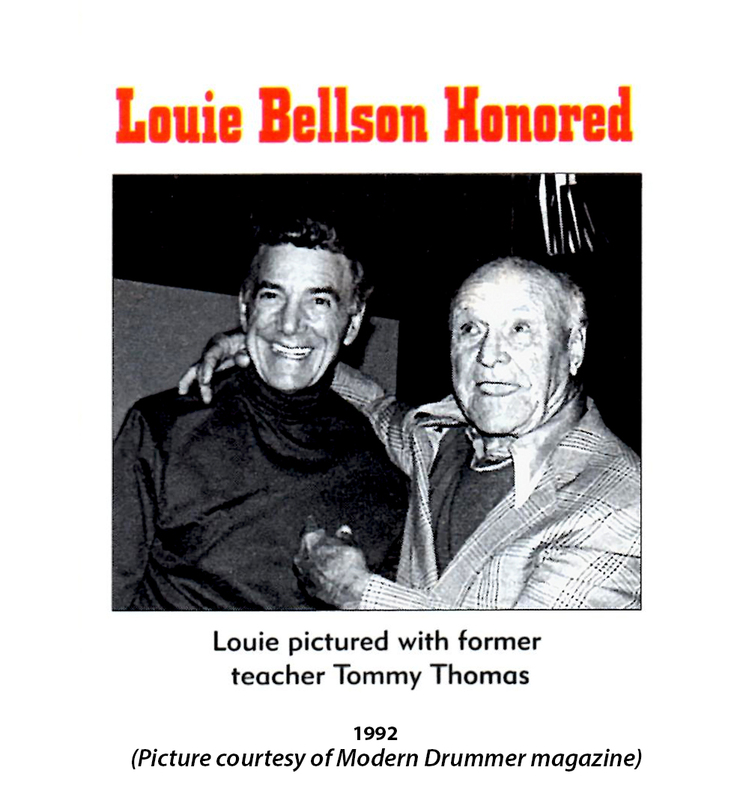 There was a big event in N.Y. at the World Trade Center honoring Louis Bellson. I think it was probably 1992 or 1993. I told the organizer, Jerry Ricci, ‘Well, you gotta have Tommy!’ They asked, ‘Well, who is Tommy?’ I told them all about Tommy but he wouldn’t fly any more. So they sent a driver down to Tennessee to drive Tommy up to that event in N.Y. It seemed only appropriate that he be there. It was a great surprise for Louis that he was there. Steve Gadd, Butch Miles and Les DeMerle played. You see, Tommy knew everyone who was somebody in the business. All of the players: Gene Krupa, Lionel Hampton, Davey Tough, and everybody that I mentioned before; all of those people knew who Tommy was. All of the manufacturers knew Tommy. 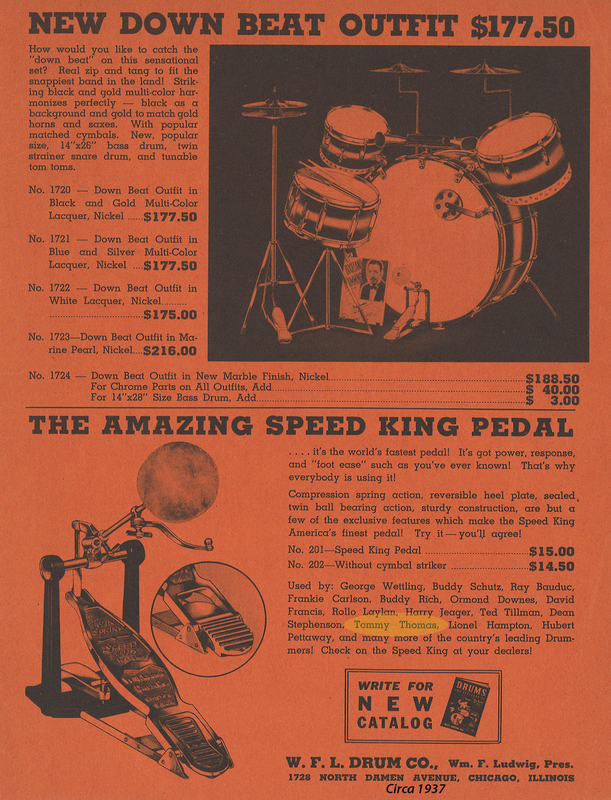 Tommy is mentioned in the 1933 Ludwig catalog, and notably in the 1937 WFL catalog for using the new Ludwig Speed King pedal. 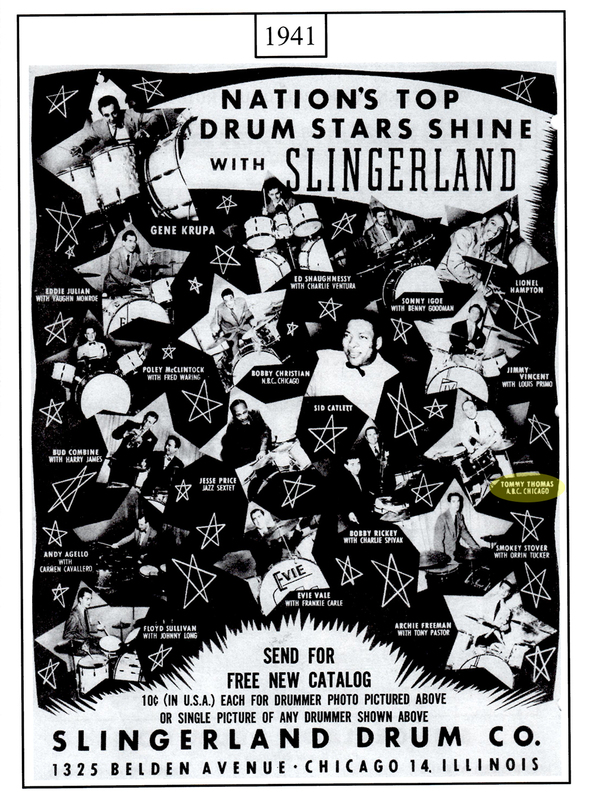 Tommy had an endorsement with Zildjian, Gretsch and also later with Slingerland. 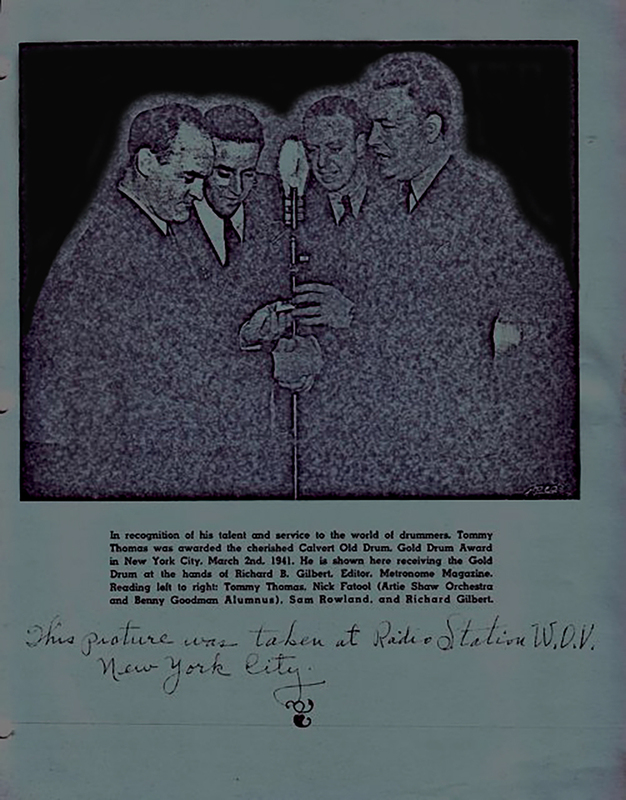 Tommy was also best of friends with William F. Ludwig, Sr. I think that’s why he (WFL) gave Tommy those two beautiful Ludwig drums, i.e., the 6.5 X 14”” engraved Ludwig Black Beauty and 5 X 14” Super-Sensitive. So this all took place in Chicago. Tommy started playing, went on the road, probably around 1920. So he traveled on the road for 10 years. His career, what he did, was he was playing all of those vaudeville theaters all across the country in the United States. Tommy played all those shows with unknown people at the time like Bob Hope, Bing Crosby - all those people. When he got to Chicago around late 1920s and early 30s, he started working the theatres. He met William F. Ludwig. He started working those big theatres in Chicago. Everybody was in Chicago. He was in a band with Benny Goodman at the time before Benny Goodman had his group. He was in these pretty big, well-known groups. During the ‘30s, he was going over to Louis Armstrong’s house and playing on Sunday jam sessions, doing all that stuff. Going out to the clubs. Probably in the late 30s/early 40s, he taught himself how to read and how to write music, how to do all that stuff. He became a staff musician for the ABC Broadcasting in Chicago. He became a staff musician; he played the drum set. Then war broke out. He went and he did 26 months in the Coast Guard. When he came out, he went back to ABC and then went with the Don McNeil Breakfast Show. He was on the Don McNeil show for over 20 years. What happened to Tommy’s drums when he passed away? 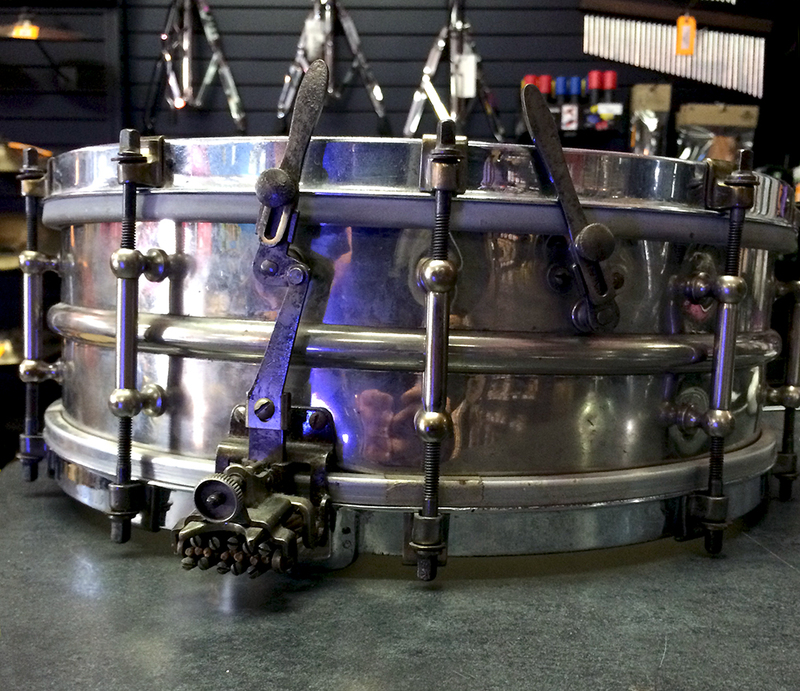 Steve Grier has two beautiful vintage Ludwig snare drums that he said belonged to Tommy Thomas. Can you confirm these were Tommy’s? Do you know how Tommy died? “I started taking lessons from Kenny Sukhia in 1971. I took lessons from him until he went away to college. He told me about Tommy Thomas, a great drum teacher, who was teaching at Drum World in Orlando (owned by Steve Grier). In September of 1972 (I was 13 years old), I started my first lesson with Tommy Thomas. I’ve still got my Haskell W. Harr Drum Method book that we originally worked out of. I took weekly lessons with Tommy on drums and tympani until 1976. I found a cancelled check the other day. Guess how much my lesson was? It was $3.50/half hour and later went up to $5.00! Tommy had a ton of students; he was pretty popular. I still have my N.A.R.D. certificate that I got that Tommy signed off on. I’m pretty proud of that. I also took some lessons from Don Lamond (his lessons were $6.00/half hour). So how did you and Michael Welch get to know each other? “Back in the 1970s, Orlando was really a jumping place for musicians. A lot of stuff was happening then. My brother was 5 years older than me and was working as a keyboard player. He introduced me to some of the more established musicians in the area. Since I was kind of young at the time. My brother wound up playing in a band with Mike Welch, and that’s how I met Mike in 1974. So together we shared our love and respect for Tommy Thomas. As said best by the late Maurie Lishon, former owner of Frank’s Drum Shop and close friend of Tommy Thomas, “Tommy’s friends are countless around the world. He was a helluva show drummer but he admits I was a better tap dancer!” And from his close lifelong friend Louis Bellson in a 1993 letter (signed Louis “Crickett”), “It’s always a great thrill to hear from you…I hope I can see you sometime soon. I really miss you. We love you Tommy”. Yes indeed, Tommy was loved by many. Clearly, Tommy’s contributions to music history were immense as a drummer, teacher, mentor, and friend to many. I wish I had the chance to meet him in person. However, I am sincerely grateful for the efforts for Michael, Bret, Elda, and Steve for preserving the artifacts and stories of Tommy Thomas that I am able to share. 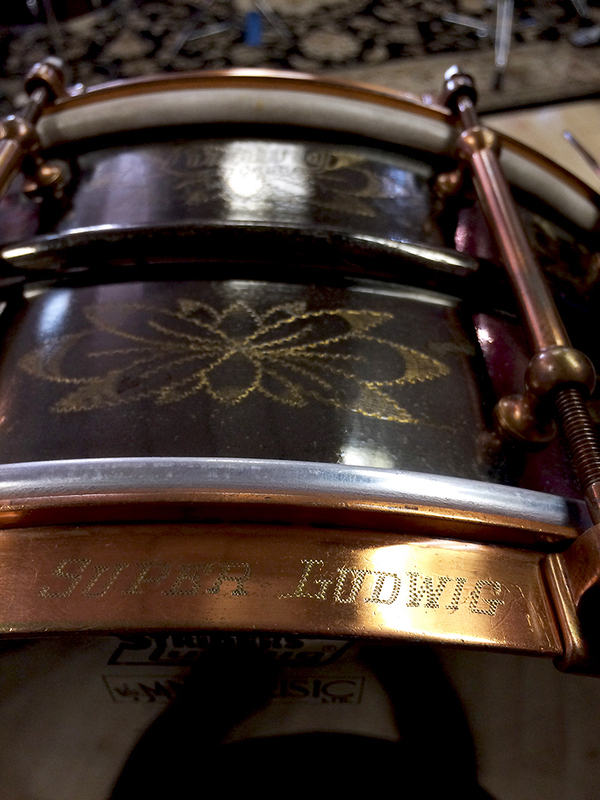 Many thanks to Steve Grier’s grandson, Brantley Shaffer, for providing pictures of Tommy Thomas’ snare drums. I am deeply indebted to Michael Welch who provided the majority of background information for this article. Michael remains devoted to seeing the memories of Tommy Thomas properly preserved. He is planning to release a book later this year on the “Tommy Thomas Percussion Library”, including over 300 lessons and more in-depth historical view of Tommy’s work.